Written by Phil Whitting on 23rd April 2018 . To enable development and testing of infotainment systems, FalTech has designed and installed a multi-function repeater system inside a research facility which previously was an RF-denied zone. In-Vehicle Infotainment (IVE) and In-Car Entertainment (ICE) systems are integral to most vehicles these days. 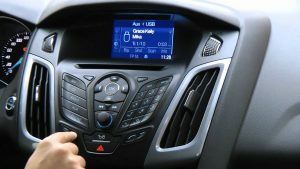 In this connected world, the minimum expected level of equipment in a new car includes FM/DAB radio and GPS satellite navigation systems. Not to mention video players, in-car internet and WiFi, USB and Bluetooth connectivity and eCall technology. 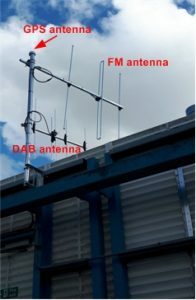 One automotive company that FalTech GPS worked with was having a problem with a lack of GPS, FM and DAB signals inside their research building due to the blocking effect of the largely steel structure. The situation caused frustration and delays as the only way to test any of these systems was to take the prototype vehicles outside in order to receive a usable signal. A custom-designed repeater system was installed to provide live GPS, DAB and FM signal throughout the facility. Outside the building a steel mast supports a GPS antenna at the very top, with DAB and FM yagi antennas below that, pointed towards the nearest transmission sites. A low-loss coaxial feeder cable drops down from each of the three antennas and ingresses the building along with other existing cables. Each cable connects to the relevant repeater, which in turn re-radiates the signal inside the building. A GPS repeater was installed on the under-side of a standard suspended ceiling tile. This small, lightweight, low-powered device emits an output signal beam of nearly 180 degrees, giving a coverage diameter at floor level of approximately 50 metres from a height of 10 metres. Satellite navigation systems can now be operated anywhere inside the building – the outdoor antenna is placed such that it can “see” around a dozen satellites and gives a 3D positional fix to an accuracy of 6 metres. GPS repeater kits from FalTech come with all the parts needed for a successful installation and will cover GPS L1, L2, GLONASS and Galileo signals if required. Also available as a custom-designed system to provide coverage in specific – sometimes very large – areas. The FM rebroadcast unit is used in many varied applications and is often matched with leaky feeder antenna cable, for example in a road traffic tunnel. In this application the output power is attenuated to suit the environment and it radiates via a small magnetic-mount whip antenna. 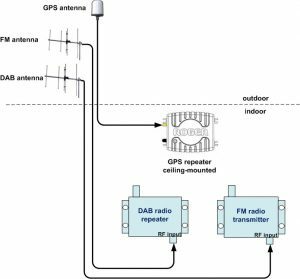 It provides an FM signal with RDS inside the building which means that car radios can be tested with a string, clean signal indoors. The unit is fully licensed and is covered by the manufacturer’s blanket license arrangement with Ofcom. To ensure good line-of-sight between its helical coil antenna and the DAB radio receivers in the building, the repeater is placed high up on a wall near the ceiling. The effective coverage area of a DAB repeater varies depending on the shape and layout of the building, and the presence of obstructions such as partitions, furniture and cabinets. 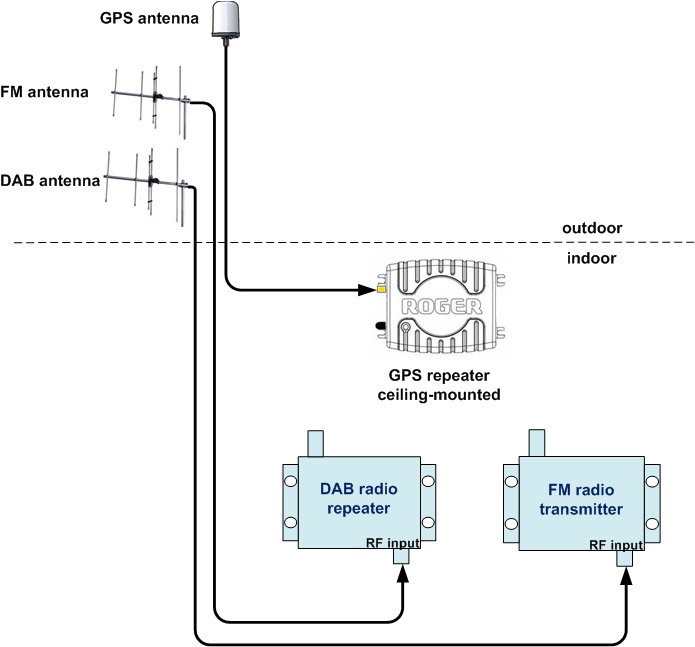 In general the repeater unit can cover an area of between 2,000 and 8,000 m2. DAB repeaters are also used in sales environments to allow demonstration of DAB radio systems in steel-clad retail units and are available in kit form. They are fully licensed for use in most commercial environments, although not available for use in domestic properties. This professionally designed and installed multi-function repeater system allows work to be carried out inside a facility that was previously devoid of any usable GPS, FM and DAB signals. 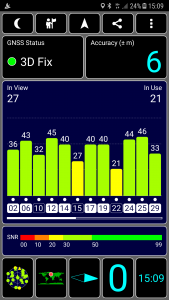 The amount of time saved by not having to take equipment outside the building to receive a live signal is significant – workflow is notably more streamlined. The system took just one day to install by a fully licensed, qualified and insured installation company. We can work with you to create a custom-designed system if the requirement is larger or more complex than a GPS repeater kit can handle; just let us know what you need and we’ll happily work with you to ensure you get the right solution. You can email us through the contact page or if you would prefer a good old-fashioned chat we still have a telephone in the office – call 01326 336 444 in the UK or +44 1326 336 444 from outside the UK.